=> Unstable bright night with variable conditions. => Unstable night with bad seeing and some technical problems. Were closed by humidity at about 01:00. SAAO Astronomer reaching for the stars! 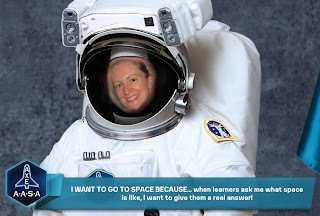 Former SALT astronomer Nicola Loaring, who is currently employed as the Outreach Astronomer at the South African Astronomical Observatory has entered a national competition to win a trip to Space! If selected Nicola plans to use the experience to drive outreach activities at the SAAO. Please vote for Nicola at https://www2.axeapollo.com/en_ZA/138109/nic-loaring?image=0 and share the link in order to help her reach her goal! => Clear night with strong wind and bad seeing. => Repetition of the previous night. Clear sky and unstable seeing. => Clear night with very unstable seeing changed in the range 1.1" to 5"
=> Bright night with moderate seeing. => Stable night with good seeing, but problems with alignment. A clear night with excellent seeing of mostly 1.1" but also several technical problems. We invite submissions of Berkeley Visible Image Tube camera (BVIT)  science commissioning programs to be carried out during the remainder of  2012 Semester 2 (i.e. up to 30 April 2013). A small allocation of time  (~30h) is set aside for this and the purpose is to exercise the  instrument and to test its performance on a variety of short programs. These programs will not be charged. BVIT is a visitor instrument built at the Space Science Laboratory of  the University of California-Berkeley. It is a photon-counting camera  with a ~1.9 arcmin field of view, capable of very high time resolution  (millisec or microsec) photometry with a B, V, R or H-alpha filter. It  can be used for objects with magnitudes ranging from V~12-20. Please note that BVIT does not provide high precision absolute  photometry, but by observing nearby standard stars a flux intensity  relative precision of ~ 5% can typically be obtained. Every detected  photon is assigned a time of arrival and a (x,y) position on the  detector, which allows an observer a high degree of post-acquisition  data analysis flexibility. Users should also be aware that the instrument does not have an  autoguider, although guidance checks can be done as needed by  interrupting observations for ~1 min. Typically we can observe without  guidance corrections for up to ~50 min, depending on the object position. Applications can be completed using the usual Phase 2 PIPT proposal  form, selecting the "commissioning" button. The scientific  justification needs not to be too detailed or lengthy and should simply  summarize the particular regime or aspect of the instrument that will be  tested, and the type of target to be observed and its parameters. The  observing conditions and observation details can be entered with the  PIPT, as usual. Proposals should ideally be submitted by 10 Feb and will be selected by  the BVIT instrument team, in conjunction with SALT Astronomy Operations,  with priority to those programs expanding the parameter space of the  instrument. TrIeD a P0 TaRgEt FoR 2012-2-RSA_OTH-014 bEfOrE tWiLiGhT bUt It WaS tOo ClOsE tO tHe MoOn. ThEn ClOsEd DuE tO rIdGe ClOuD. OpEnEd LaTeR iN dRoP iN hUmIdItY, oNe BlOcK oBsErVeD fOr 2012-2-RSA_DC_OTH-001. ThEn MoRe RiDgE cLoUd. Completed one block for 2012-2-UW_OTH-001 before closing up around 11 pm due to heavy clouds. Ridge cloud lingered for the rest of the night. High humidity and clouds. No observations taken. Rain, thunderstorms and high humidity. No observations tonight. A roasty toasty night, starting at a balmy 24.5 deg outside. Lightning and patchy cloud evolved into heavy cloud and rain. No observations tonight. bumpy night with a few glitches at the start and awful seeing throughout. acquired data for 2012-2-RSA_OTH-014, 2012-2-UW_OTH-001, and 2012-2-RSA_OTH-002, but didn't accept any of the blocks because of technical problems for the first and poor conditions for the rest. ridge cloud threatened through most of the night with half the night spent at RH > 80. it didn't reach the closure threshold until the last half hour before morning twilight, though. seeing was good for a spell, but otherwise mediocre to poor and highly variable due to strong SE winds. lost the first block of the night for 2012-2-UW_OTH-001 first to rapidly deteriorating mirror alignment and then to a cable bundle that worked free and vignetted the beam. after that accepted blocks for 2012-1-GU-001, 2012-2-RSA_DC_OTH-001, and 2012-2-RSA_OTH-002 (x2) with rejected blocks for 2012-2-RSA_UKSC_RU_UC_OTH-001 (seeing blew up) and 2012-2-RSA_OTH-002 (humidity spiked). dry, dark night with a few clouds at the beginning and then thick clouds for the last hour. in between it was relatively stable with decent seeing (1.1-1.5") even in spite of 45+ km/h winds at the beginning. accepted three blocks for 2012-2-UW_OTH-001 (x2) and 2012-2-RSA_OTH-015. attempted LR fabry-perot for 2012-2-RU-007, but technical problems torpedoed it about half-way through the scan. clouds set in while acquiring target for 2012-2-IUCAA-004 so no real data obtained there. good night, weather-wise, with decent seeing for long stretches, especially in the first half. completed long FP block for cui (2012-2-UNC-001) and a long slit block for ravindranath (2012-2-IUCAA-004). attempted blocks for vaisanen (2012-2-RSA_OTH-015) and srianand (2012-2-IUCAA-1), but lost them due to the mirror stack falling apart and a bout of weird network glitches that caused the track to abort a few times. The other evening at dinner we were discussing where one would site another large telescope at SAAO, if one were to do so. I quipped that it should be on the SE corner of the plateau by the 74" because that's where the wind comes from. I got a hearty laugh and a scoff, but I was not completely kidding. In my experience the wind is from the SE much more at night than it is during the day. And many times I've seen westerly winds during the day quickly give way to SE winds soon after sunset. So I'm not completely crazy! The most probable wind direction at night is ESE. Fully 1/3 of the time the wind at night is coming from between E and S and quite concentrated between E and SE. 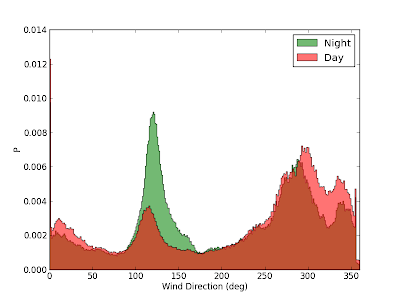 However, 45% of the time the wind is coming from between SW and N so westerly winds are still favoured at night, but not by nearly as much as during the day. This nearly 180 degree change between night and day helps explain why SE winds tend to bring bad seeing. During the day the sun-heated ground creates convection that couples the surface air with dry, westerly, upper-level winds. However, once the heating goes away, the surface layer decouples and allows cooler air from the southeast to flow in. The friction between the westerly upper level winds and easterly surface winds creates turbulence which in turn degrades seeing. On nights like tonight when the upper and lower level winds are both from the SE, the seeing can actually be pretty decent. Unfortunately, nights like this are not the norm so my idea ends up pretty crazy in the end. struggled with mirror control problems for the first few hours and then closed for humidity at 23:30. in between completed one block for 2012-2-UKSC-002 in spite of 2-2.5" seeing. entire night lost to high winds and then clouds and humidity. only engineering data taken. Others: Veronica. Amanda at 7 to help with calsys tests. Clear, mostly dark night with good seeing and no technical problems. Others: Veronica. Simon and Amanda at the very beginning to fix sky cam. Clear night, starting with mediocre/poor seeing but with patches of good seeing. Humidity forced us to close just before start of twilight. Clear, stable, photometric and productive night with good seeing. Others: Veronica. The Potter family just to watch SALT open. Beautiful clear night with poor seeing until about 22:30. Good seeing night with high cirrus and high wind. The humidity climbed steadilly and forced us to close at 1am.
. Bright night, closed early due to combination of high humidity, high wind, and ridge cloud. the lack of telescope fault. and the start of 2013!